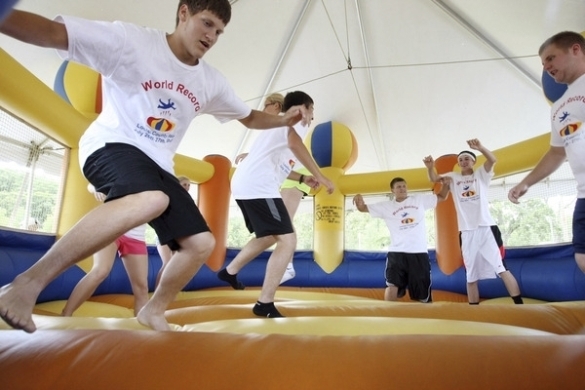 In 2012, a group of eight students from Louisa County high schools successfully set the world record for “Longest Marathon On A Bounce Castle”. These kids worked as a team and spent 27 consecutive hours in a bounce house, according to an article published on the World Record Academy website. The team took turns, jumping in shifts on their way to the record-setting 27-hours of bouncing. The exciting event took place at the Louisa County Fairgrounds in Columbus Junction, Iowa. These students successfully broke the previous record, set in Rossford, Ohio, which had been 26 hours. An event organizer explained that the goal was to create a countywide team of jumpers to bring the community together while working toward the world record. Organizers recruited interested students from three different high schools in the area. Volunteers from Columbus High School, L&M High School, and Wapello High School worked together to keep the action going. Over the bulk of the time, students bounced alone in the inflatable, taking 20-minute shifts. These shifts gave students two hours and 40 minutes between shifts. While not jumping, the kids played cards, watched television, or slept. As the minutes dwindled down, though, they all bounced at the same time to break the record together. While 27 hours seems like an intimidating total to beat, just over a year after the Louisa County team established the record another team took it on. A group of eight friends from North Somerset, UK chased this record for a charity event. They didn’t just beat the old record – they smashed it, tallying up 36 straight hours of jumping! Even if you do not have aspirations for setting a world record in a bounce house, you can still turn up the energy and have fun jumping in a rented inflatable.